Ever price one of those fancy portable boat air conditioners? About 800 bucks! Ever price the same BTU household air conditioner? About 100 bucks or less! Sense a project coming here? And it’s one that is especially relevant given our recent hot weather! Actually, Dan Johnson stopped by the boat store the other day to show me a project he had developed. Dan sails a Coronado sailboat out of Charlestown Marina. The project was a neat way to mount a standard 5,000 BTU window air conditioner in a sailboat. 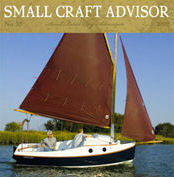 Now, you may not have a sailboat but this project may be adaptable to your boat. Dan’s boat, as do most sailboats, has a tapered companionway opening. Several boards drop down into this opening to close it off. This project involves revamping those drop boards to accommodate a standard household air conditioner. I’ll relate Dan’s project and provide you with several drawings and a photo or two. Hopefully, this will give you enough information to adapt this project to your boat. Dan did away with the original set of drop boards and divided the opening into two sections, an upper one and a lower one. We’ll talk about the upper section at the end of this article. Most drop boards are about of three quarters of an inch thick, so Dan chose some exterior plywood of that thickness. You can get fancy here and use teak or mahogany faced plywood or go with standard fir; just make sure that it is exterior, as it will be exposed to the weather. The first step actually involves the air conditioner unit itself. You will be lifting the A/C unit in and out of the mounting and most units aren’t very well equipped for this. Balance the unit on a dowel or small piece of wood to find the balance point. Install a handle on the top of the unit at this balance point. A standard garage door handle works fine. That way it will be easy to pick up without being heavy on one end or the other. MAKE SURE YOU KNOW WHAT IS UNDERNEATH THE CASE BEFORE INSTALLING THE HANDLE. I’m sure that drilling a hole through a cooling line is going to void your warranty. The A/C mount will be installed in the lower drop board. Cut it to size, with the top and bottom edges sloped to match the angle of the companionway opening. Lay out an opening for the unit, making the opening about an eight of an inch wider on each side. You want it wide enough to slip the A/C unit in place but not too wide to allow all your cool air to escape. Notice that the top of the lower board has been cut off. Make sure that this is a fairly substantial piece as it helps lock the unit in place and prevents it from tipping. With the top section of the lower board cut away (remember to cut it at the same angle as the top and bottom of the rest of the board) you can cut the center section out. Cut carefully as this center section becomes the support shelf for the A/C unit. You now need to find the proper location for the support shelf. It should be far enough inside the cabin that the top section of the lower board clears the inside flange of the A/C unit, helping lock it in place. With the proper position determined you could now fasten two locating cleats to the bottom of the support shelf. These should be spaced far enough apart to allow the shelf to slip down over the lower edge of the drop board and prevent fore and aft movement. The air conditioner has some weight to it so you will also need to make a rear support leg for the A/C support shelf. Dan hinged his so it would fold up compactly. When you calculate the height of this support remember to allow for a bit of a slope away from the inside (cooling) end of the unit. This will make sure that the condensation will run away from the unit and not drip below. To reduce vibration you might consider slipping a piece of foam rubber under the A/C unit. The unit itself can be secured in place with a bungee cord wrapped around the shelf and the unit. The final step is to apply a finish to the plywood components. I would recommend sealing all the voids in the end grain of the plywood with epoxy filler. I’d also give the plywood several coats of epoxy to seal it well. Just make sure that you don’t build up too much thickness or the boards will bind in the companionway slots. Finally, apply a couple of coats of marine paint if you used fir. If you used a better grade of plywood and are finishing the unit “bright” apply several coats of high UV protection varnish. That finishes the actual air conditioner mounting system. If you’ve stayed with us, you’ve saved about $600-$700 and are well on your way to staying cool at the dock. Dan did one further enhancement to this project by converting the upper drop board into a set of swinging doors. They have Plexiglas inserts that let in a little more light below. I’d like to thank Dan for sharing his project with us!